Walk into Dr. Abhineet Sheoran’s office and you’re as likely to have him show you his latest research findings on cryptosporidium that are pinned to his wall as you are to hear an endearing story about one of his two teenage daughters. 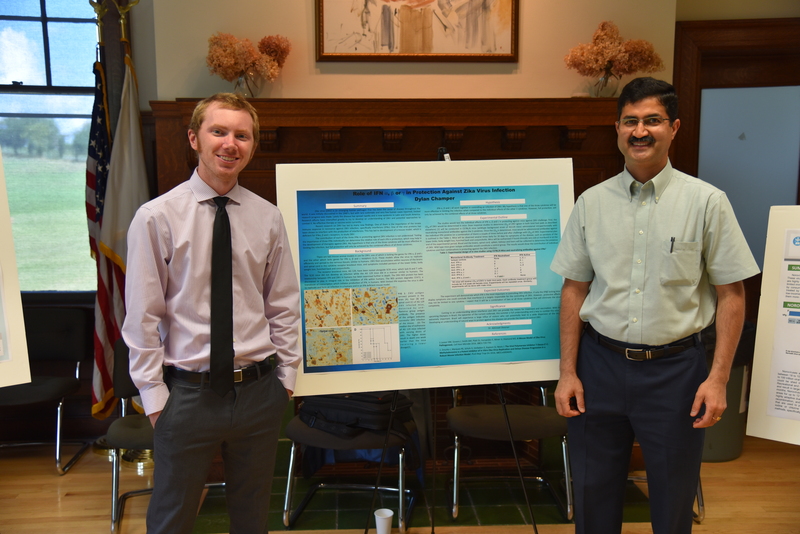 Dr. Sheoran with his mentee Mr. Dylan Champer, an MSIDGH student, who is presenting a poster on research project that he developed during the summer semester. Assistant professor Abhineet Sheoran, DVM (BVSc), MS, PhD, is an immunologist and infectious disease specialist, and director of the 12-month master’s degree program in Infectious Disease and Global Health (MSIDGH) at Cummings School. A true family man at heart, he brings a caring perspective and years of expertise in the laboratory to his students, whom he wants to see succeed as much as he does his own children. 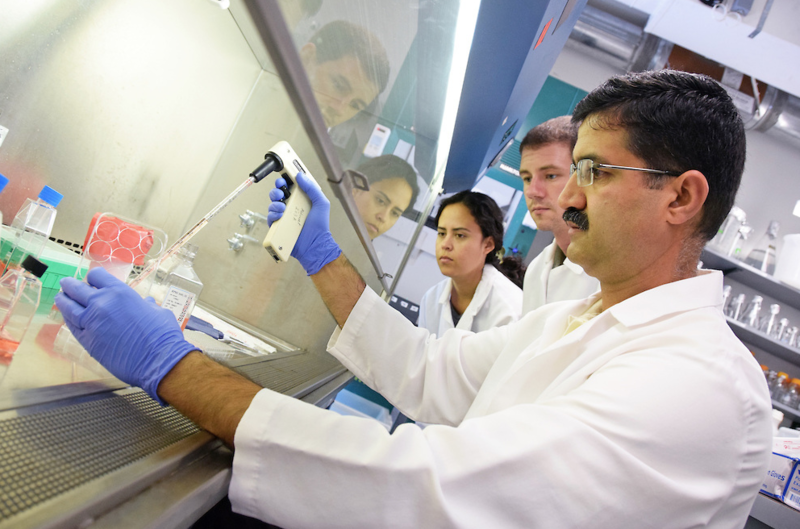 After receiving his PhD at the University of Cambridge, England, Dr. Sheoran realized his dream to come to the United States, continuing to study the equine immune system at the Gluck Equine Research Institute in Kentucky. He began to focus on the human side of infectious disease when, in 2000, he joined Cummings School as a researcher in the Department of Biomedical Sciences, under the direction of Saul Tzipori, DVM, PhD, DSc, FRCVS, Chair, Department of Infectious Diseases and Global Health. 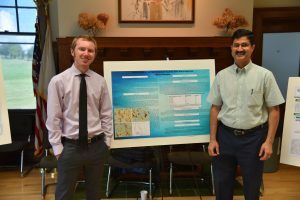 Dr. Sheoran is working on developing a vaccine for cryptosporidiosis with Dr. Saul Tzipori. Together, Drs. Sheoran and Tzipori are working to develop a vaccine for cryptosporidiosis, a global zoonotic disease affecting children in Africa and South Asia. 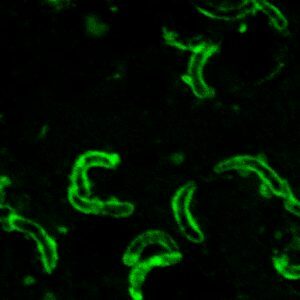 Their laboratories are also working to develop an antibody-mediated therapy to protect children and adults against hemolytic uremic syndrome, which develops after infection from enterohemorrhagic E. coli, a disease present in developed countries such as the United States. 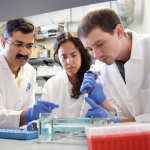 Research is one of Dr. Sheoran’s professional passions, but when Dr. Tzipori asked him to spearhead the development of a new master’s program in infectious disease, he accepted the project with vigor. 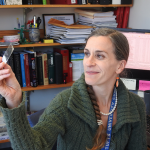 “While continuing to engage in research investigations into serious human enteric infections, Dr. Sheoran has demonstrated his passion for educating the next generation of infectious disease scientists through his efforts to successfully establish and now lead the MSIDGH graduate program,” says Dr. Tzipori. all of whom have different aspirations. Some view the program as a way to prepare to work in the biopharmaceutical industry, public health or state laboratories, while others are preparing for the rigor of PhD, MD or DVM programs. Dr. Sheoran uses his own practical research experience to guide the master’s students on their professional journey. “It’s like I have 15 different children. I want to mentor and guide each student to meet their professional goals and ensure they garner the skills necessary to succeed,” he says. Dr. Sheoran recognizes that, with a new educational program, there’s much room to evaluate, refine and improve the curriculum. He offers support as students hone critical presentation and writing skills. He also encourages his students to go back and review material they may have gotten wrong on a test. Dr. Sheoran uses his own practical research experience to guide the students on their professional journey. “We take a systems approach to understanding infectious agents and diseases they inflict globally. The program is designed to allow students to apply classroom learning to laboratory techniques courses, where they acquire skills and tools to solve real problems, such as developing diagnostics, vaccines and immunotherapies,” he says. 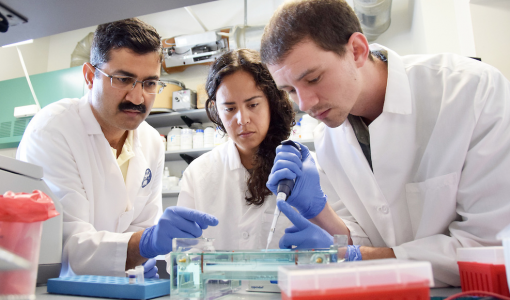 In the end, Dr. Sheoran hopes to help develop each of his students into a scientist, whether they have the desire to further advance the field of infectious disease and global health, or make an impact in other biology-related disciplines. This twelve-month Master’s Program in Infectious Disease and Global Health (MS-IDGH) at Cummings School was created to address a critical need. Emergence of new or increasingly virulent infectious agents, antimicrobial resistance, and the risk of deliberate dissemination of bio threat agents are serious evolving threats to human health.